Home Tags Posts tagged with "rainbow trout"
As I wrote a couple years ago, fishing the Salmon River in autumn can be pretty hectic. Thousands of fishermen, many of them about as clueless as me, crowd the river bed, the shores, and the bridges, occupying every inch of public land available. At the same time, anybody in a 50 mile radius who owns a boat is drifting in the middle of the water, trying to target the same holes from a different angle. People take up their positions way before sunrise, and prepare to defend the little square foot of land or water that they’ve claimed for themselves. On top of that, during the salmon run, a lot of the fish aren’t even very good! Once they enter the river, the salmon are no longer actively feeding. They’re on their way to spawn upstream, where they will die a few days later. As a result, their flesh tends to have an unpleasant muddy taste — not that it stops anyone from bringing their catch to a cleaning and smoking station, in hopes that the smoke will mask some of the undesirable flavors. 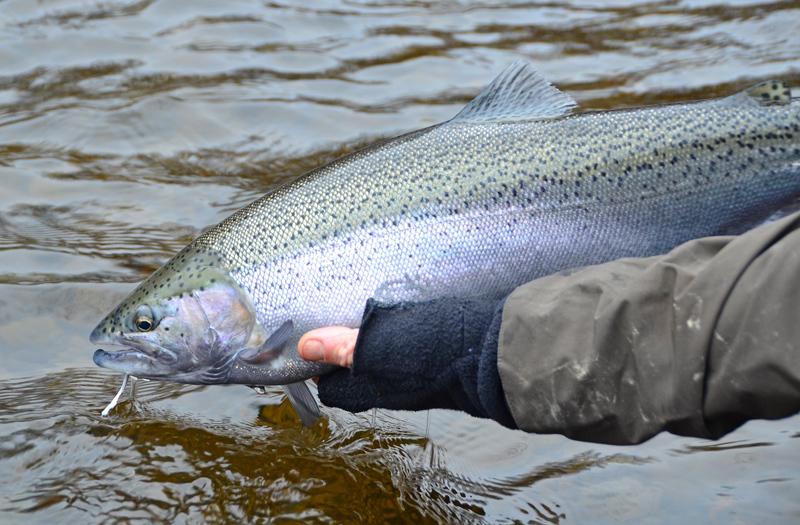 The flesh of the Salmon River steelhead does still have a bit of that muddy taste. The reason? Two chemical compounds with an earthy odor, 2-methylisoborneol and geosmin, which are produced by the algae in certain water courses. According to this article, the two compounds are absorbed through the gills of the fish and accumulate in the flesh quite quickly (within 24 hours), concentrating especially in the fatty skin and dark muscle tissues. There are solutions, some better than others. Obviously, you can remove the aforementioned parts of the fish wherein the chemicals accumulate the most, and you can rinse the fish under clear water. As I mentioned earlier, some people also try to mask the taste, by smoking the fillets or adding spices. I’m only moderately fond of that approach, because I still want my fish to taste like fish, so I’ve got two more tricks up my sleeve. First, you can exploit the fact that geosmin breaks down in acidic conditions, and marinate your fish in lemon juice. Second, using the foodpairing method, you can try preparing the fish with other ingredients that contain geosmin, such as beets. 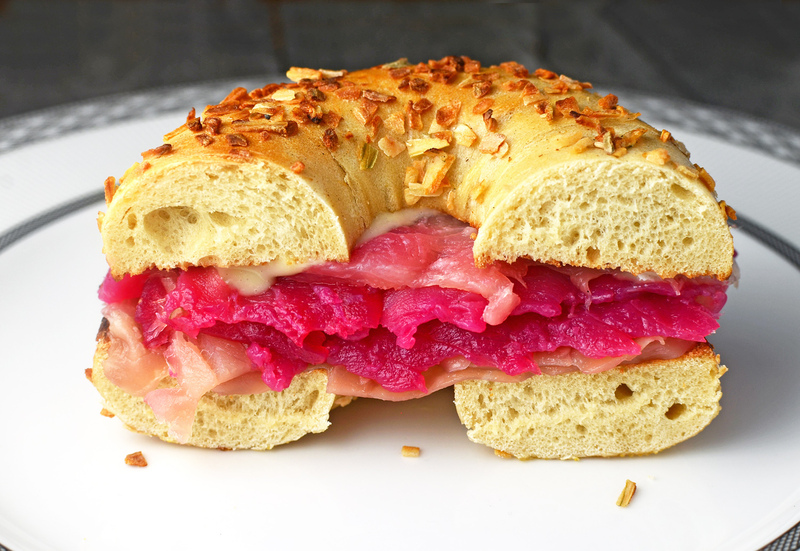 And there’s no reason why you shouldn’t combine both tricks, which is what this beet-cured steelhead recipe does. This is a very simple recipe. The marinade might remind you of another one I posted a long time ago, the cranberry and dill marinated salmon. However the result is quite different, as the beet creates a purple ring instead of the even red color brought by the cranberry juice. I’ve also kept the booze from my vodka-cured lake trout, because I like the mellow result produced by the vodka. I’ve been trying to cure fish in walnut oil for quite a while now, to reinforce the slightly nutty taste found in many salmonids. But try as I might, I’ve never gotten the fish to taste any nuttier after marinating than before. Then the obvious finally hit me: why not serve the walnut oil with the trout instead of using it in the marinade?! I came up with a walnut mayonnaise, and it delivers exactly the result I wanted. If you’re intimidated by home-made mayo, I’m suggesting a couple of store-bought alternatives: goat’s milk butter and chive cream cheese. 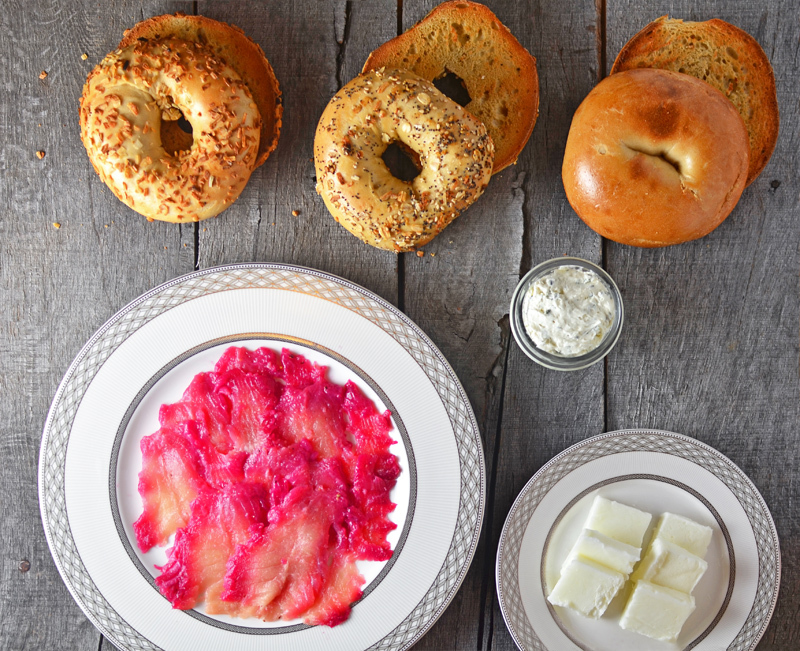 Serve the fish with the best bagels you can find. In New York, the ones at Zabar’s ain’t half bad. 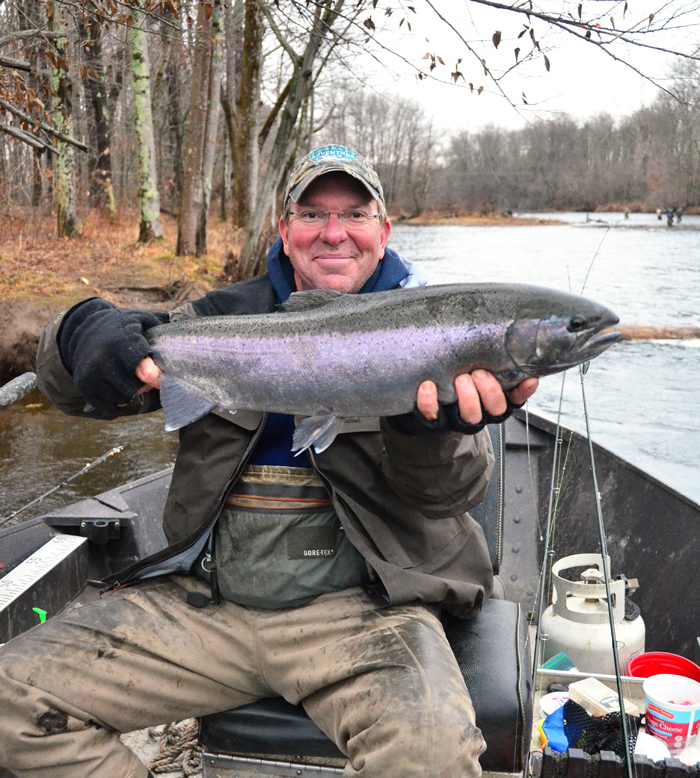 And that secret to avoid competing with thousands of anglers for a spot on the Salmon River? Go fishing the Monday after Thanksgiving. Whether it’s the long holiday weekend with family or the post-turkey food coma, most fishermen seem to find something else to do that day. Place the beet juice, vodka, lemon juice, canola oil, salt, sugar, juniper berries, and black pepper in a blender. Blend on medium speed for 1 minute. Place the steelhead fillets in a large dish. Pour half of the marinade, and spread over the fish. Flip the fillets, and repeat with the rest of the marinade. Cover with plastic wrap, or transfer to a sous-vide pouch (including the marinade!). Refrigerate for 48 hours, flipping the fillets (or the pouch) every 12 hours or so. Take the fillets out of the marinade, and pat with paper towels. Use the fish within 3 days. In a bowl, mix the egg yolk, mustard, lemon juice, water, and salt. Optionally, sprinkle the xanthan gum while still mixing. Slowly dribble in the oil, and whisk until the mayonnaise is thick and the oil is incorporated. Keep pouring the oil in a thin stream while whisking. Cover with plastic wrap, and refrigerate. 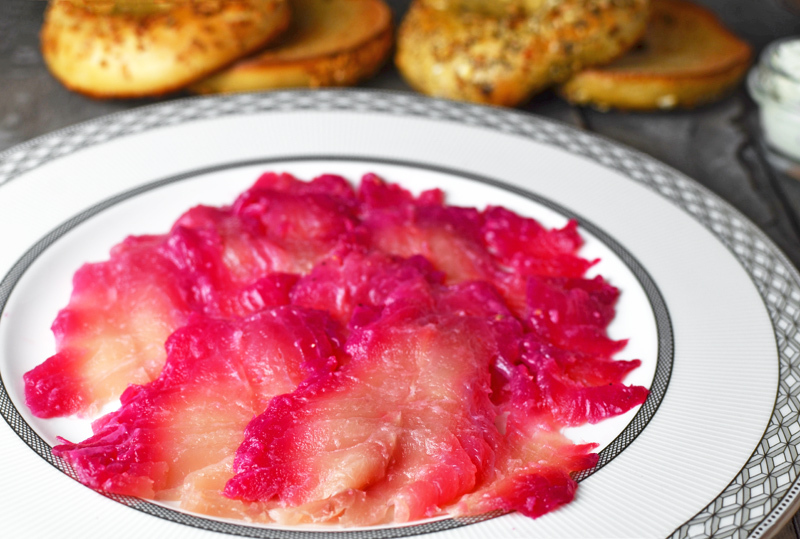 Thinly slice the cured fish, and arrange on a plate. Slice the bagels lengthwise, and toast until golden brown. Serve with the walnut mayonnaise, goat’s milk butter, and / or chive cream cheese.